If I’m not working, you’ll usually find me either gardening, cooking or blogging. 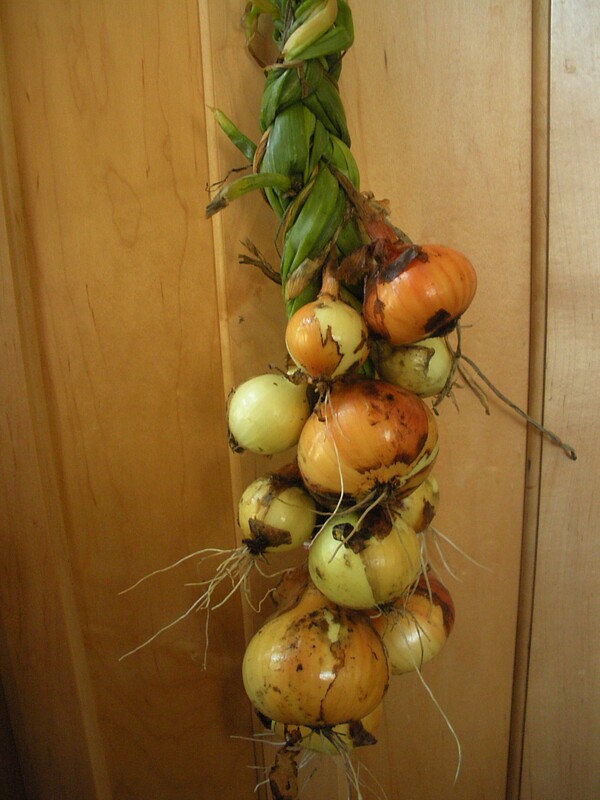 We talk often of our gardens and what we’re growing here and you’ve seen many images of the fruits of our labor. I thought this week we could show some of what we’ve been mixing up in our kitchens, or over the fire on some days. The REAL food challenge continues all year long for some of us. Here are a few things that I’ve been cooking up at Chiot’s Run. If I have posted a recipe for the food in the image you can click on the image to head on over to my post that includes the recipe for that dish. I (Xan) did all my cooking last week for our Lammas party–we’ve been subsisting on fresh fruit and leftovers this week! 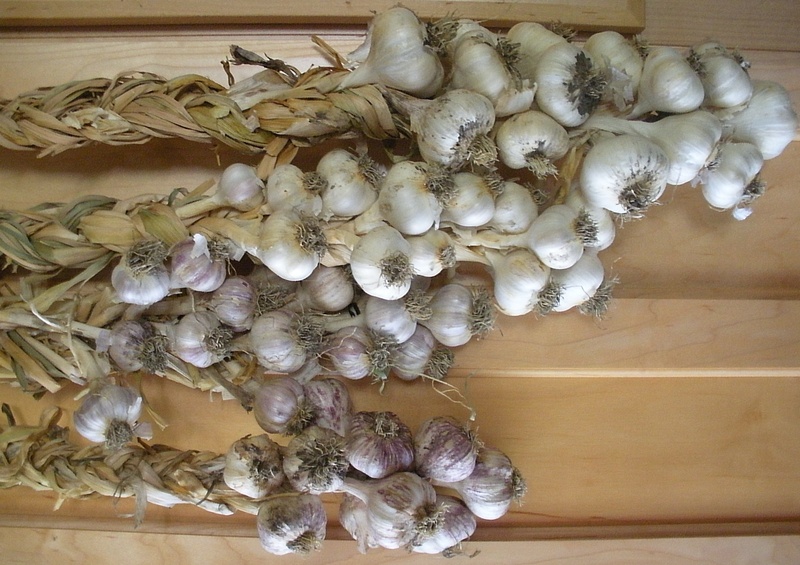 I’m going to send you over to Mahlzeit to see what I’ve been cooking; what I’ve been doing in the kitchen mostly this week is figuring out garlic braids, and I think I nailed it. Only took me, um, years. What have you been cooking up this summer? There is this amazing thing happening all over the world lately, and the media has recently gotten wind of it, claiming it’s a “new trend”. In fact, it’s been building over the past few decades and it seems to be coming to a head. It’s this bizarre, unprecedented trend of 20-and-30-somethings to become involved with agriculture. I didn’t even really know I was a part of this trend until recently. I’ve always known I wanted to farm somehow, but I never dreamed that I would be attempting to grow and preserve food on the scale that I do now. The best part of this recent rise in agriculture and environmental awareness is that it’s not just about the 20-and-30-somethings, though they certainly get the most press since it’s Oh-So-Hip to be a farmer right now. 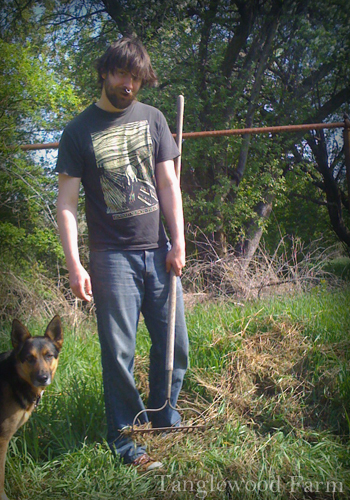 My husband, Jeremy, is a 30-something guy gaining interest in agriculture. No, it seems like every age demographic is experiencing a rise in awareness, at least here in the states; it’s as if it’s happening to us as a culture rather than only as a specific age demographic. People all across the country (and in many cases the globe) are changing their ways, with a surge of interest and involvement, by growing their own food or actively promoting more sound agriculture practices. Whether it’s just to save a few dollars on the grocery bills, to keep the kids busy with a summer project, or to take on “the man” with an intense drive to be off the grid and self sustaining, it seems like so many people are simultaneously waking to the concepts of more local and sustainable agriculture, and the reduced ecological footprint. Still, there are others who do have an interest but don’t act simply because they either think it’s too time consuming or it’s too difficult. Whether or not these people are just looking for excuses is really more their deal than mine, but I like to think that the best thing for these on-the-fence people is to have others shove them off the fence. By any means possible, I like to try to inspire, nudge, shove, push and drive others to grow their own food, or at least to have a say in what goes into their bodies. Sometimes all it takes is my ridiculous repeated facebook updates on homesteading to make them think maybe they can do it too. Sometimes it takes a little more coaxing, in the case of my mother (“You can do this! You will do this! OR ELSE.”) More than anything, I think inspires others to hear stories about how simple it is to get started. By writing, blogging and documenting about just how easy it is to get started it’s possible that a few of these people may realize that they too can be directly involved not only in this fantastic upswing in ag/eco-awareness, but also in their own well-being and health. It’s time that we as the individuals and small communities take control of ourselves, our bodies, our world… to bring things just a little bit back towards balanced. Anyway, the other day I was sitting in my living room and it occurred to me that I didn’t know where my husband was. He had been doing laundry in the sun-room/porch a moment before, but was suddenly no where to be found. I wandered through the house sort of lazily looking for him (our house really isn’t any larger than a cottage) and finally found myself looking out the front door to the yard where he stood, determinedly pinning clothes to the clothesline. I stared, open-mouthed for a few seconds and then (naturally, as a blogger) ran to grab my camera. My husband was hanging his clothes on the line. I caught Jeremy hanging his laundry on the line. Don’t get me wrong, he’s a very environmentally conscious guy, but he had never gone this far before. It suddenly dawned on me. I have definitely “rubbed off” on him. In fact, I think I’ve “rubbed off” on, or nudged or poked or prodded (or demanded) a lot of people. I’m pretty sure I guilted my mother into growing vegetables this year, but she’s loving it now! I’m definitely the kind of person to guilt people into things. Don’t have time? Too bad, make time. Don’t have the money? You don’t need it, here have some seedlings. Don’t have the space? Don’t kid yourself – you can grow food in a pop bottle on a windowsill if you have to. I can be pretty brutal, but I think that’s what it takes sometimes. Whether it’s my mother, my in-laws, my teenage students, my students’ parents, my readers, or even complete strangers: I’ve found myself preaching to them about the need to become more proactive. That’s a goal I try to pass on, too. Make people believe that they can do things on their own. No task is too great if you put your mind to it. 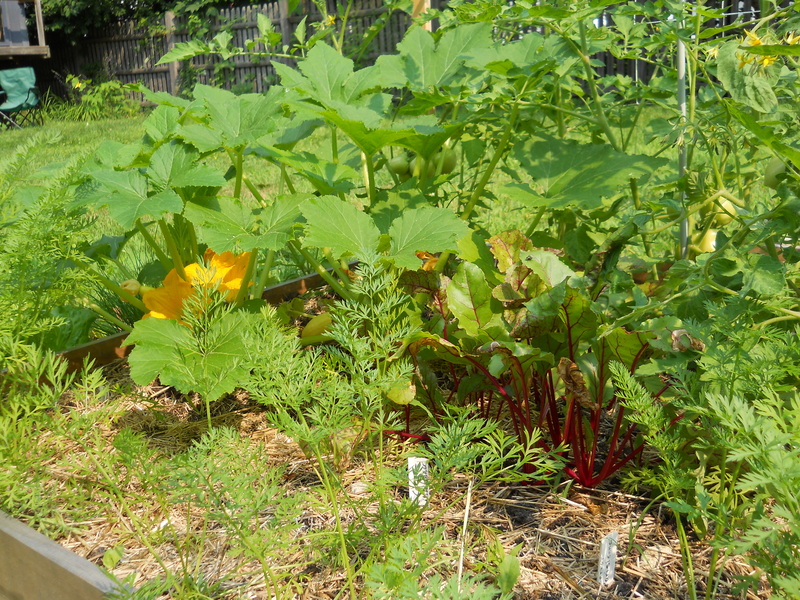 My 17 yr old student, Ellen’s Garden, is in it’s second year after I helped her get it started. So I guess I come to you with a challenge today. Try inspire growth in yourself and the people around you. Encourage yourself to actually try the thing you’re researching, instead of just reading up on it. Offer to help someone get started in something that you already do that they show interest in. Buddy up with someone, even. Sometimes it’s easier to try new things when you’ve got a friend by your side. So many of the blogs we post here (and across the internet) are about things that we’ve never done before, and there’s no reason you can’t do these things too! During the month of August I’m doing a special at Chiot’s Run called “Alphabet in August”. Every day we’ll focus on one letter of the alphabet and try to come up with words or phrases that describe us. It’s a great way to excercise your creativity, both verbally and with images if you can come up with them. They can be serious, funny, good, bad, things you love, things you hate. Grab a piece of paper and a pencil and start adding words and phrases to the list when you can think of it. If you’d like to join in on your blog you can grab the image from my Flickr Photostream and link in the comments below or on my blog. I’ll be including a list of everyone that’s following along. We’ll be officially kicking it off on Monday, August 1st and starting with the letter A on Tuesday, August 2nd. We’ll take Sunday’s off for a bit of a break. So who wants to stretch those creative muscles? I went to high school smack dab in the middle of high corn country–Champaign County, Illinois. (Well, it’s corn now. In the 40s it was hemp. It was fun going to high school there!) We lived, literally, in the last house in town. We were surrounded on three sides by corn fields. I walked through it, skated on it, and more than once accidentally ran into it (blame the, ahem, “hemp”). I never thought that someday I would actually grow it. But I love growing corn. 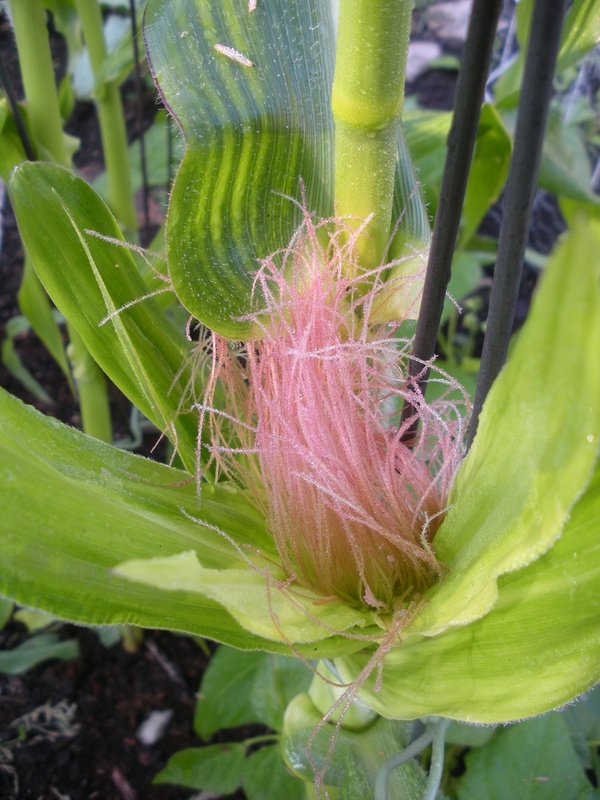 I grew my first backyard corn in 2007, and every year I find out something new about this amazing plant. Its unique vascular system that self-waters during droughts. 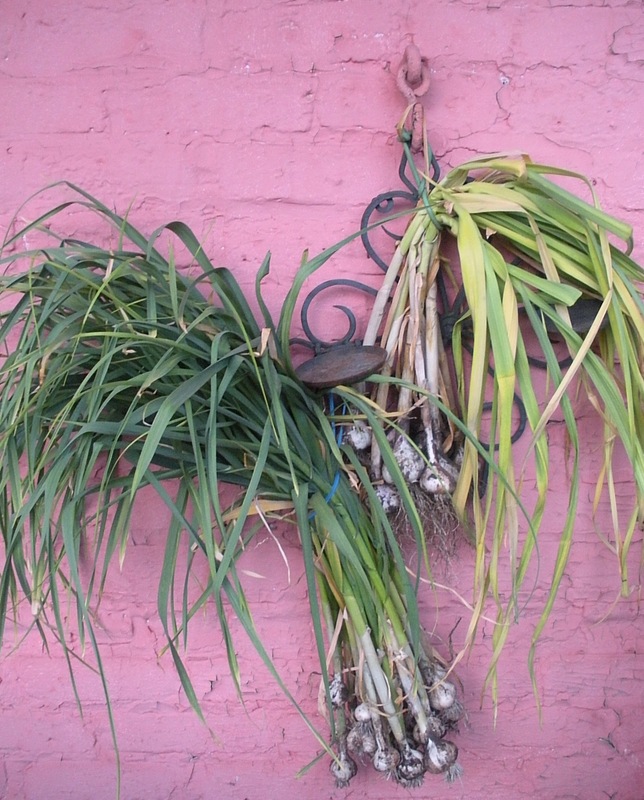 The “adventitious feet” that keep the top-heavy stalks from falling over in our variable weather. That every strand of silk goes to a single kernel–if you’ve got “holes” in the ear, it’s because that one strand did not get pollinated. Corn is such an iconic plant. For Americans I think there is no plant that moves us as deeply. Corn is ours. It’s in our earliest mythology and rules our midwest (where everyone is from, right?). Someone simple and honest is “corn fed.” In Ur-America, it was currency. 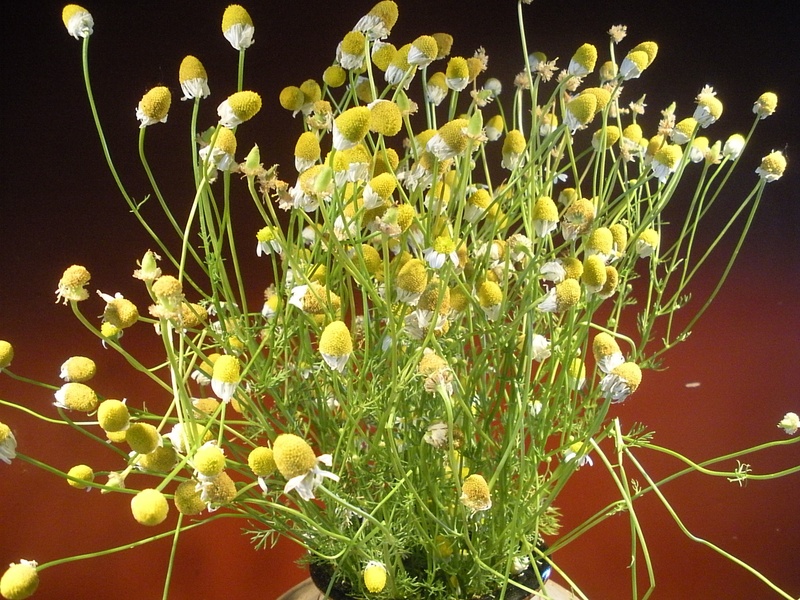 It’s an amazing and wonderful plant. 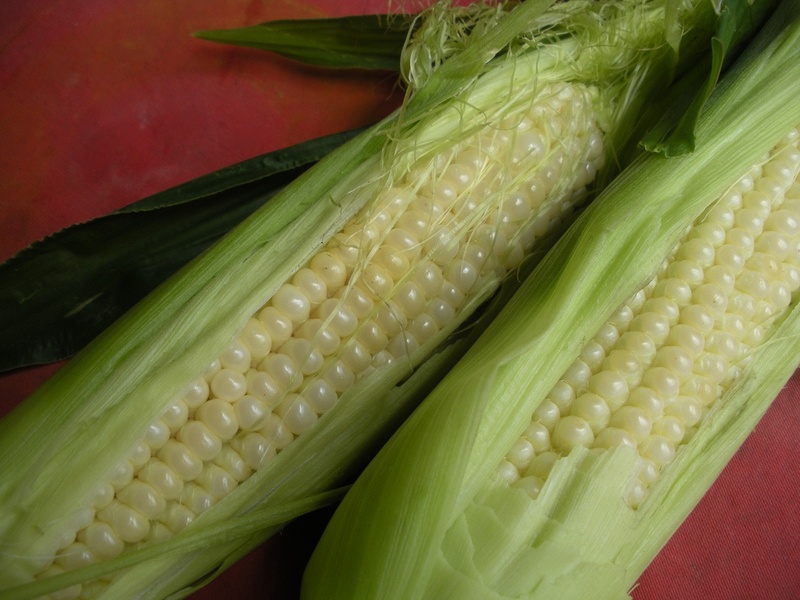 Corn grown sustainably and eaten correctly (i.e. not in monoculture and not processed into everything you consume) is a marvelous food– high in protein and nutrients, easy to preserve, beloved by everyone. It’s fun to grow because there’s always something going on. 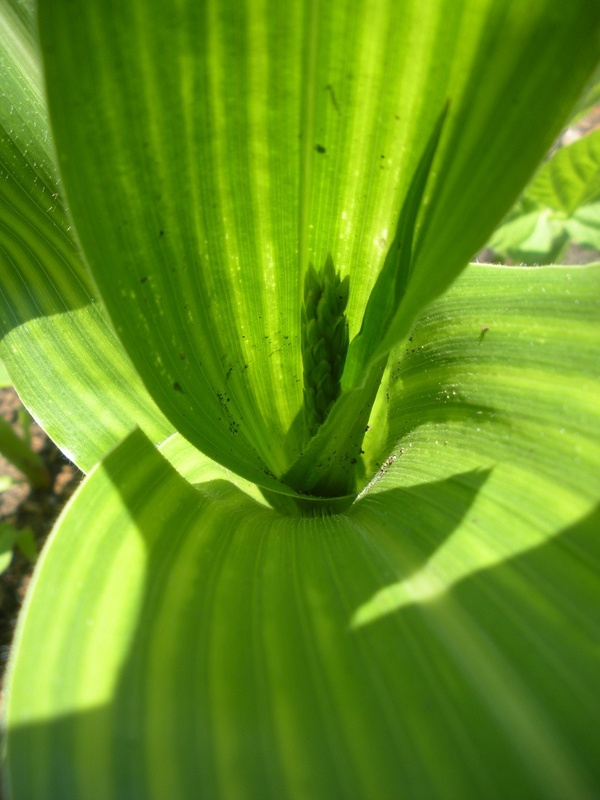 Once the corn has reached its maximum height, a tassel, the male flower, will form at the top. After this happens, ears start to form where the leaves and the stalks meet. They start as just a little darker green thickening with translucent buttery-white silk forming after a few days. The pollen from the tassel drifts down and pollinates the impending ears turning the silk a soft pink. You mostly don’t need to hand-pollinate corn, the wind takes care of it. After a few days, the silk turns a deep mahogany and the ear starts swelling in earnest. Pick it when the silk is brown but not dry, and milky liquid squirts out when you press a fingernail into a kernel. Corn handles transplanting well, inasmuch as it stays pert even after replanting, but doing this really slows down its growth and the seeds sprout so well it hardly matters. The first two years I grew it, I planted in dense rows along a fence. The last 3 years I’ve done 3 Sisters–corn, beans, squash. (The rabbit gets the beans. Sigh.) In one of the beds I tried a desert technique–multiple seeds in a single hole. Another fun discovery was “corn feet.” You plant the Three Sisters in a mound, which I always thought was for the squash at the center, although I had read that corn would root horizontally into the mound, both anchoring the dirt and preserving the mound shape, and strengthening the stalk. 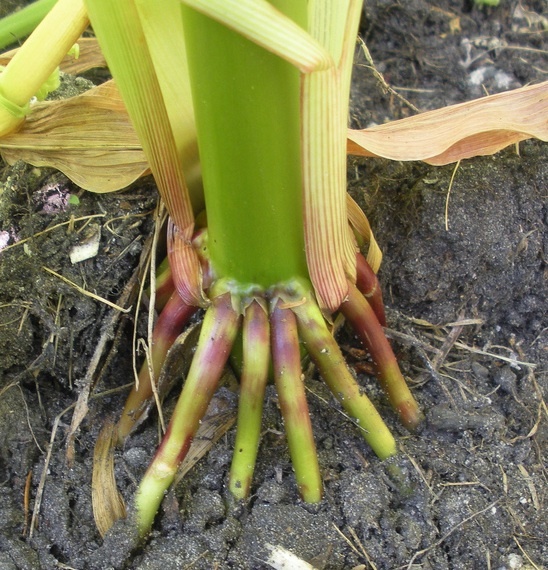 Turns out corn sends out these cute little blunt-tipped feet called “adventitious roots”; the ones on the high side of the mound do indeed go horizontally into the dirt. The ones on the low side grow straight down like Midwestern mangrove roots. It’s a little corny, but it makes me feel like a patriot to look out my backdoor and see corn. Now, please keep me out of farmers’ markets for the rest of the summer, hmmm? Here at Chiot’s Run I go to the farmer’s market almost each week. I buy a few things that I don’t have room for or don’t want to grow in my garden. I don’t usually grow zucchini as I can get it super cheap from local farmers. 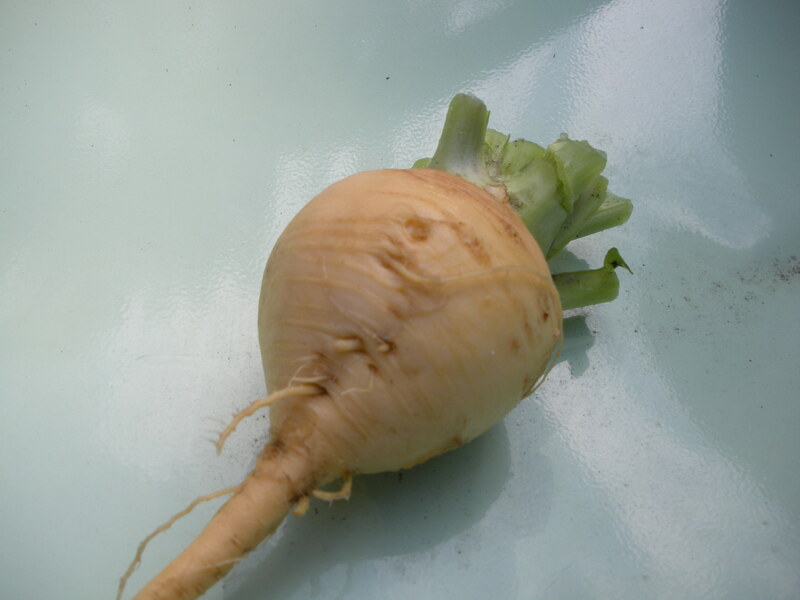 I’d rather use the space to grow celery, which I can’t find locally. 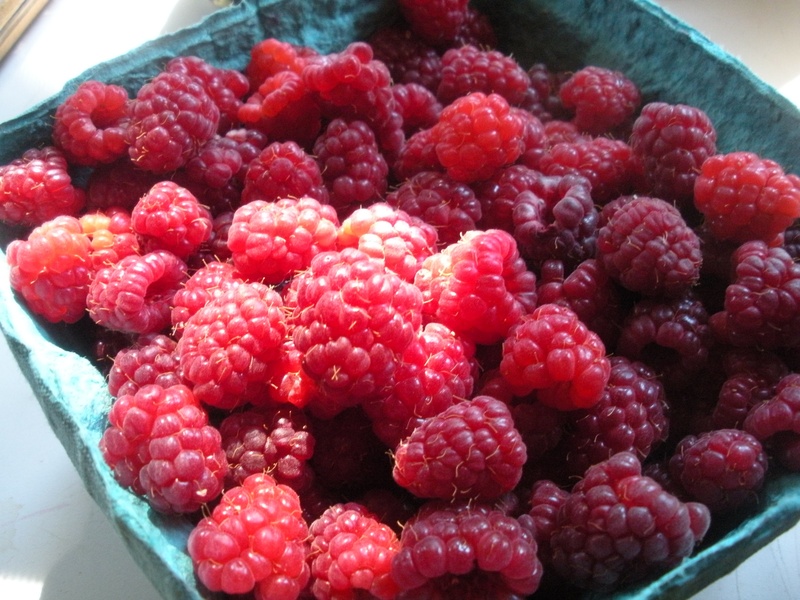 I love my local farmer’s markets – there are two that I attend. One is a regular outdoor type with vendors. I do love chatting with the farmer’s, but since it’s only open on Saturdays May-Nov and I usually have to work on Saturday’s in the summer I don’t get to go as often as I’d like. The one I visit most often is set up a bit differently. The farmer’s aren’t there, they set up booths and you walk around the various stations. You pick up everything you need from everyone, then pay at a central cash register – there are even bar codes on things. While I did miss talking to the growers when I first started going to this market, I now realize this is much better for them. They can spend their days working in their fields rather than being at the market. I also love that it’s open Wed-Sat, which is good for me since I work most Saturdays. It’s also open year round and they carry thing like cheese, grains, vegetables, meat, milk, pottery, yarn and soaps. I can pretty much get anything I need from Local Roots in Wooster, OH. What did you pick (or pick up) this week? Mr Chiots and I were talking the other day and I said, “What did I ever do with all my time before I started blogging and gardening?”. Then I laughed and said, “I guess I kept the floors clean”. That is so true. I used to be crazy about having clean floors and a clean house. My floors were vacuumed and moped three times a week, the bathrooms cleaned several times a week, and a dirty dish rarely was seen in the kitchen. Then we started a business and our busy season happens to be in summer. Gardening came along next and naturally canning and preserving followed. Before I knew it, I had too much on my plate and there was no way I had the time to keep up with the thrice weekly floor cleaning. There’s simply no way to keep the counters clear when you have vats of pickles and sauerkraut fermenting that need tending. Summer’s bounty from the garden usually coveres half the table and I’m about to move all those tomatoes just to wipe the table down every night. The floors can get pretty dirty with all those trips in and out and with three pets living inside. At first it really aggravated me when the house was messy and I would stay up late and use every spare minute to try to keep up with it. Then I decided to give myself a break. I noticed that the more leeway I gave myself the less it bothered when the house got a little cluttered. I must admit, I almost appreciate some clutter now as I feel it makes my house looked lived in. I also feel like it helps visitors feel comfortable knowing that I didn’t spend hours cleaning before their visit. That being said I can only let it go so far before it needs cleaning up. The bathrooms still get cleaned once a week and the kitchen gets tidied up almost every night, though not scrubbed to sparkling. The floors however can go two weeks *gasp* between cleanings now and it doesn’t even bother me. The dust bunnies will hold a convention at the end of the hall and it doesn’t phase me when I walk by. Now that I allow myself to let a few things go, I can breathe easier in the summer. I would much rather spent my precious spare time going for a stroll at sunset than inside mopping the floors. What’s the first thing to do when you get busy? I’ll take you on a walk. Down those paths maybe. 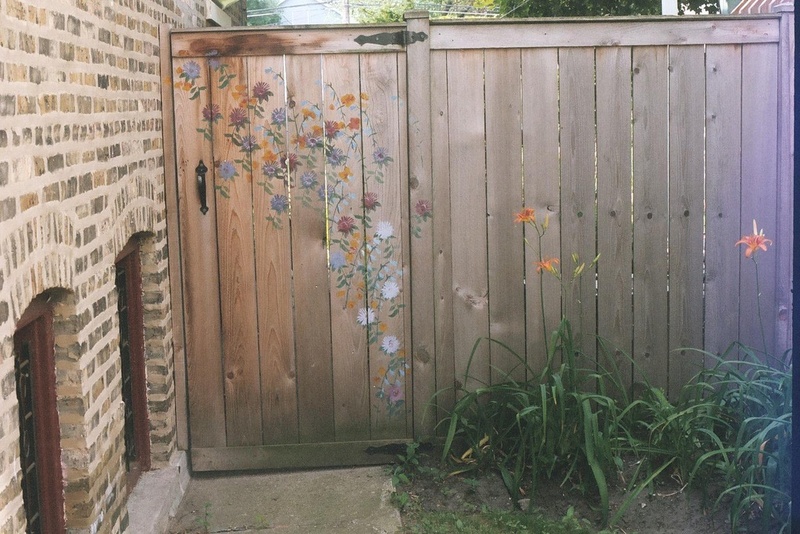 Close your eyes and imagine you enter through a tall wooden gate, painted with flowers. The neighbor rebuilt his side, which my door is hinged to, and now it doesn’t close properly. My daughter says the sound of gate pulling open gives her goosebumps. One of these days I’ll pull out the wood plane and fix it. The gangway–that narrow walk between the buildings that is so typically Chicago–is dark and spidery. I always think about Dorothy and friends stepping out of the forest into Oz– “step out of the dark step out of the woods step into the light”– because once you get through the gangway there is no more shade. This is a full sun garden despite being surrounded by trees. An accident of arrangement means that the shade misses everything but the house. I often think I’m a gardener purely by accident, because if I’d had shade, I’d probably never have tried it, since no one in my family ever gardened. As you step out of the gangway and past the cellar stairs, you first hear and then see the pond. It’s supposed to be inauspicious to have a water feature at an entrance, but the only other place to put it was in the wealth bagua, which is worse (my children are shaking their heads in despair at this point). If you like, come around the end of our “puddle” and sit in the one shady corner (but only after 4 p.m.). Just a couple of old porch posts set up as a bench, where you can listen to the water running and try to spot all 5 fish. Up a path past pond and cottage garden, down a path past cottage garden and berry patch (still new–just mulch and seedlings pretty much. Is that a strawberry?) Down the sidewalk, and peer into the tomato patch to see if anybody’s red. This bed is Fort Knox of Chicken Wire in an attempt to keep our resident rabbit from eating all the beans. Two pastes, 5 slicers, 4 types of cherries. Some basil and some zucchini, stupidly planted in the shade of the tomatoes, so it isn’t very happy. Who plans these things anyway. Hook a left past the original bed, shaped like a half circle. There are no straight lines in my garden, or my life. 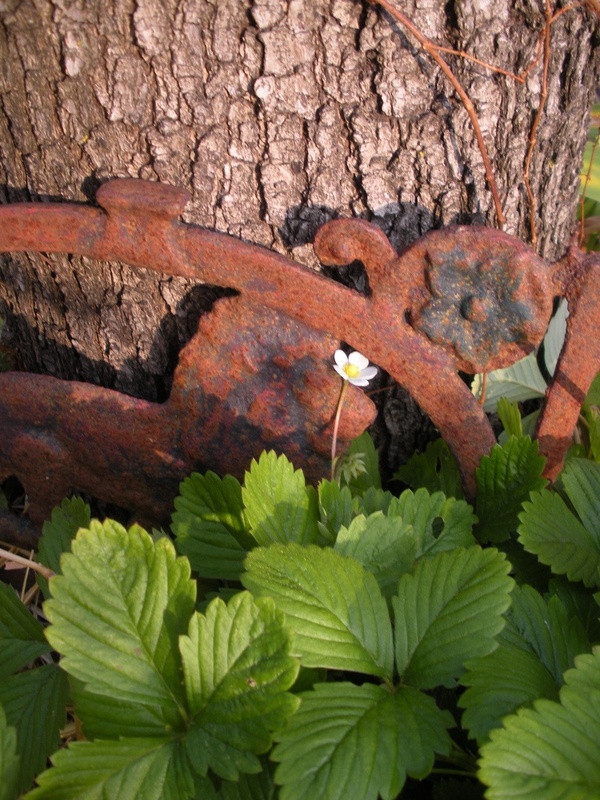 The garden, like the gardener, zigs and zags, never really settling on anything. The half circle bed has corn this year, in a Three Sisters bed, although the rabbit has pretty much taken ownership of the beans. There are skinny little paths through here, too so I can groom and harvest, but my paths are never as wide as they should be–I just hate to give up the space where I could be growing things. Tomatillos, parsnips, carrots, black beans, leeks, Swiss chard and Brussels sprouts in a skinny box and potatoes in a SmartPot®. There’s a patio, ringed by bell peppers in pots, with an umbrella table; I’m expecting the squash to start climbing the umbrella at any time. The squash is a volunteer, way too big for my tiny space, with a sister taking over the compost pile. The fruit is oblate and yellow; some strange hybrid. Leave the vegetables and wander into Narnia, so named because my children were constantly trying to find the magical entrance when they were small; I told them if they went through the trellis entry to this path in just the right way they’d get there. To prove it, I placed Aslan against an old stump. 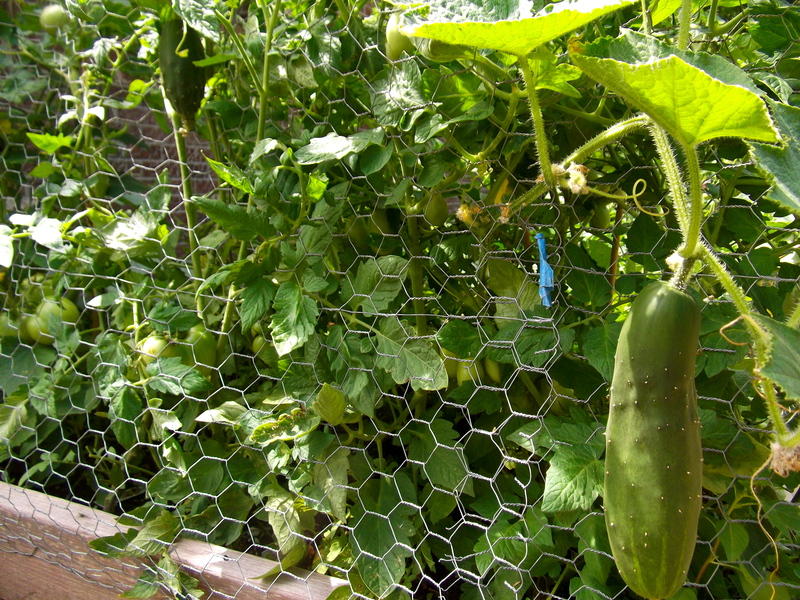 Out through the trellis and you’re back in the vegetables–a serpentine bed (lord, more curves, don’t tell Mel Bartholomew). 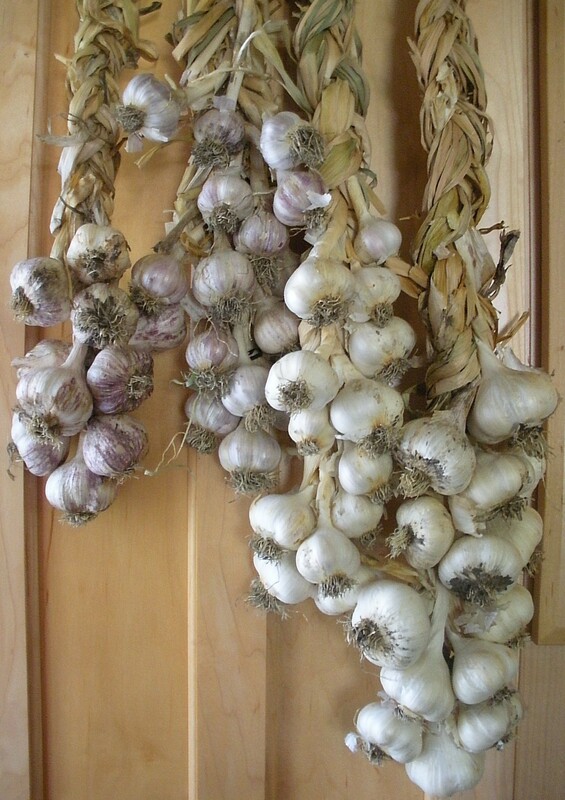 Onions, eggplants, turnips, shell beans, dill, cucumbers, more chard, broccoli, beets. Turn one way and find a tiny grassland with a glass brick path; turn the other and glass bricks lead you through an herb garden and into the other gangway. The whole walk can talk 5 minutes or 5 hours, and it’s how I start every day. Thank you for joining me!